When you hear the word “spider veins” you most likely think of someone’s legs. While the lower leg area is the most prevalent space for them to appear, surprisingly the face is also at risk for the formation of small spider veins. Broken capillaries (spider veins) can appear nearly anywhere on the body. Spider veins forming on the face can create a feeling of embarrassment. Many will try and cover them with makeup, but eventually, that makeup does have to come off. Spider veins are not easily treated and they are often irreversible. Because Spider veins will not fade with time. Once they are there, they make themselves at home. The only real course of action is preventative. The number one cause, even over heredity is heavy alcohol use. Those who heavily drink on a regular basis will also often have facial spider veins. Alcoholism over a long period of time can lead to high blood pressure. Continually high blood pressure dilates the veins of the body most visibly in the face. Many years of alcohol abuse can cause this dilation to remain open and even lock in place, causing irreversible damage to the fragile vascular network of the face. While treatment for spider veins is available, most insurance policies consider spider veins to be strictly cosmetic. Removing facial spider veins is tricky and sometimes does not fully work. It’s best not to allow them to form at all. Direct trauma to an area of the skin can very easily burst vessels and lead to spider veins. The tiny capillaries in the face are delicate, even washing your face too vigorously during cleansing can cause the capillaries to expand and break. Unlike typical bruises found other places on the body, these “bruises” do not heal without medical treatment. It’s vital to be gentle with your skin. Aging is inevitable and having a genetic history of spider veins is set in stone, but it’s important to be aware of such things and how they may affect you as you get older. 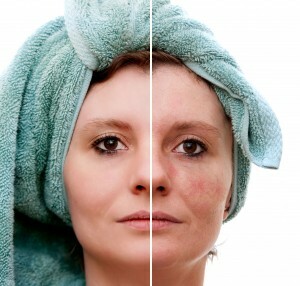 Skin Conditions such as rosacea can be passed down through generations, so your chances of having rosacea are far greater if even one of your parents has suffered from it. This type of condition will only become visible as you age, the reason being that your skin becomes thinner and more transparent over time. Once spider veins begin to show, the damage can affect their appearance and self-esteem. When it comes to spider veins, prevention is key, and though some risk factors are unpreventable, make sure that you are taking steps today to preserve your vein health for tomorrow, and you’ll reap the benefits for years to come. If you have spider veins, facial or otherwise we invite you to visit our office for a one on one consultation where we can give you a proper diagnosis and layout options for clearer healthier more beautiful skin.